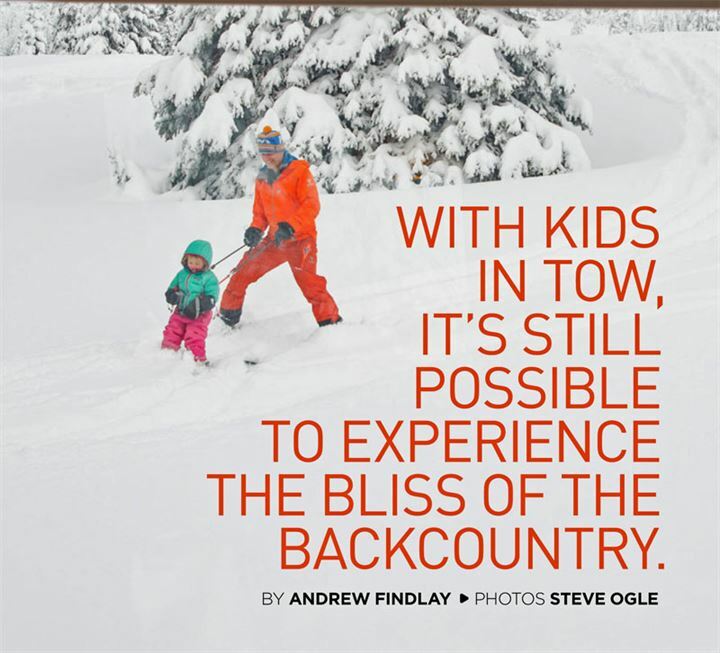 With kids in tow it’s still possible to experience the bliss of the backcountry. I’d reached that time in my life when I needed to explore a burning question in my mind: Can backcountry skiing and young children be melded into one shiny, happy winter-holiday experience? 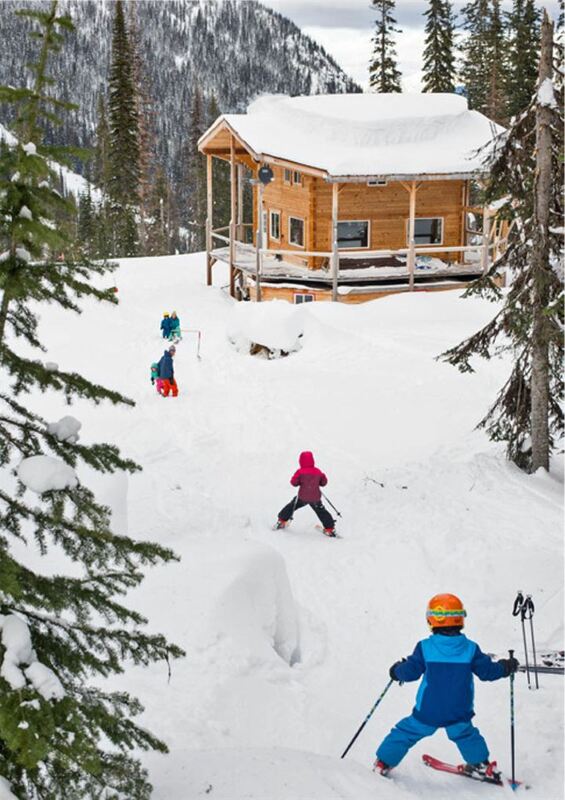 On a snowy February morning, photographer Steve Ogle and I flew with our families into Valkyr Lodge on Naumulten Mountain, one of two backcountry huts operated by Valkyr Adventures. 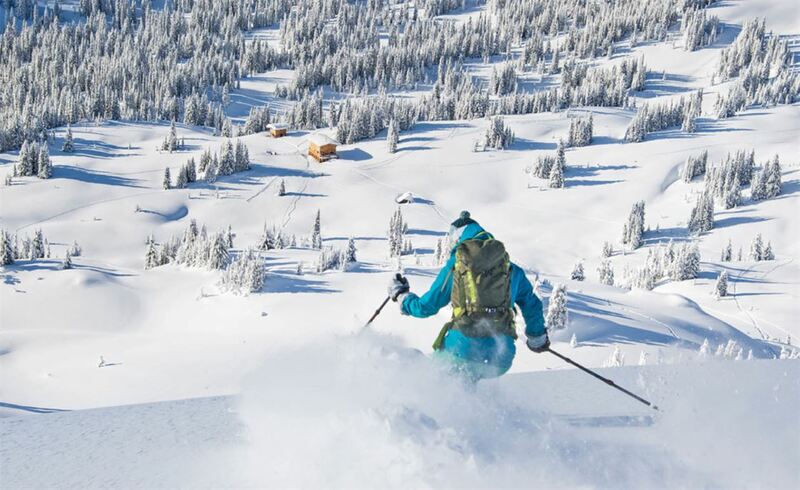 Both Valkyr Lodge and its sister, Hilda Hut, sit east of Fauquier, B.C., in the Valkyr Range of the Southern Selkirk Mountains, and are separated from one another by an entertaining daylong ski traverse—or a quick heli-flight away. This would be our inaugural, self-guided family backcountry skiing endeavour with our wives, Lisa and Amy, and between us four kids: Zola, 6; Casey, 5; Sabine, 3; and pulling up the rear at 2½, Fletch. When the chopper circled in for a landing near the lodge, it was obvious that the outgoing group of Americans had barely made a dent in the 30 cm of storm-snow that had fallen in the last few days. We would do our best to leave an impact. However, we had arrived with realistic expectations, knowing that we’d suffer the slow torture of hearing daily epic powder tales from other lodge guests as we managed our children’s experience and our skiing egos. Many years ago I foolishly thought that it would be a good idea, perhaps even a romantic one, to ski under a full moon into Meagher Creek Hot Springs in the mountains near Pemberton with my girlfriend at the time, whose idea of outdoor adventure was walking down Vancouver’s Robson Street in the rain without an umbrella. It was a disaster, a relationship killer. In fact, the relational difference this time is that my kids are stuck with me as their father. And I was determined to make them love the winter backcountry as much as I do. I’m towing two kids up a track that winds through the gently sloped subalpine forest above Valkyr Lodge. It’s a form of hard labour that makes the sled I hauled on a two-week ski traverse between Bute and Knight inlets in the Coast Mountains years ago seem leisurely in comparison. Luckily, we’re not going far, a soccer field’s distance at the most, to the top of a little bunny slope that we have adopted as a powder-skiing training ground for our little tykes to shred with their 100-cm skis. Welcome to family backcountry skiing 101. Other guests come sliding past us with powder-eating grins after a full day of getting after the goods and are now anticipating a well-earned happy hour around Valkyr Lodge’s crackling hearth. I pause briefly to watch their graceful turns before leaning back into the slope, the oily rope digging into my waist, Zola and Casey like dead weights tethered to the other end. We burn out from towing our kids before they do, and by noon we’re back at the lodge for lunch. In the afternoon, while Lisa and Amy go for a ladies’ lap on Stoney Trees, Steve begins excavating a snow cave next to the lodge. By the time our wives return, the cave is complete and the kids are bundled up again like mini-Michelin men and sliding down the tunnel entrance. Later, after the kids are wiped and sound asleep, we retreat to the sauna to plot out tomorrow’s division of labour between parenting and self-indulgent skiing. Day three is another powder morning for the kids, meaning more arduous hauling for the parents. But after two laps, Zola refuses to budge from the top of our bunny slope, complaining of cold feet and hands. The afternoon is spent indoors, a good time to colonize the lodge while the group from Rossland, B.C., with whom we share the lodge, are out for the day. At 2:30 Steve and I are free to embark on a hot lap up Naumulten Mountain. 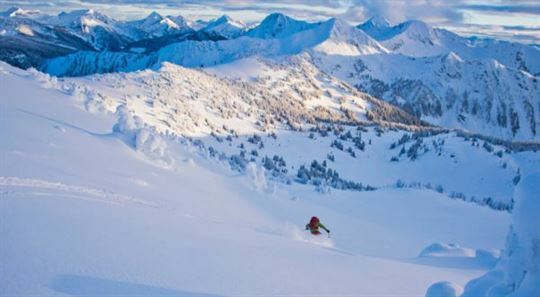 Valkyr Adventures boasts 40 square km of skiing tenure for its handful of guests; that’s nearly one-and-a-half times the size of Whistler Blackcomb. Our hosts, Martin and Shelly Glasheen, are long-time Kootenay locals. They started exploring these mountains decades before opening the first hut, Valkyr Lodge, in 2004. It was built in a meadow at the head of the Naumulten drainage, roughly midway between Revelstoke and Nelson. The terrain around Naumulten offers gentle family- and novice-friendly options, with plenty of moderate tree-skiing as well as some steeper alpine bowls and couloirs to nab when snow quality and stability permit. 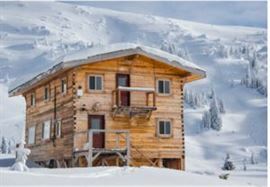 Conversely Hilda Hut, which sits at the foot of Hilda Mountain, is surrounded by much more aggressive terrain, a playground of slide paths, steep trees, couloirs and alpine features. The Glasheens have plans for a third hut, which will make possible an entertaining three-hut traverse through the heart of the Valkyrs. Weather and conditions permitting, tomorrow Steve and I will ski to Hilda, where we’ll spend the second half of the week, leaving wives to load gear and kids into the chopper for a scheduled 11-ish heli-bump over to meet us. This afternoon, we’re on a scouting mission and following a well-travelled skin track to the summit of Naumulten as the fleeting February sun dips toward the horizon. Leaving the skin track after a quick 200 vertical metres of climbing, we traverse to a shoulder that promises sheltered skiing on a run called Cri du Coeur into Heart Basin. We pause to de-skin and scope the route to Hilda Hut over the first two of four high points, Heart Bypass and Sun Dog Pass. Beyond and obscured from view, lie the Mount McBride/Mount Rollins Col, and Gateway Col.
As the sun sets golden across the Valkyr Range, Steve and I shred perfect boot-top powder down into Heart Basin. It’s shady and cold so we spend little time admiring our turns and quickly begin ascending The Prow back toward Naumulten. The lights of Valkyr Lodge twinkle on the flats below as we peel skins for our last run home. It’s mayhem when we return, the children squirrelly with cabin fever after hours of playing indoors. To relieve our wives, and out of respect to our Rossland friends who, let’s face it, likely fledged their own children years ago and probably came to the mountains partly to escape them, we take the kids outside to try custodian Randy Speerman’s “no board”—an innovation that emerged from a haze of Kootenay marijuana smoke sometime back in the 2000s that’s basically a simplified snowboard without a binding. Sometimes the best strategy with kids is extreme exhaustion. Tomorrow’s forecast calls for light snowfall and winds in the alpine gusting to 80 km/h by the afternoon. It’s tomorrow or never for the Hilda traverse, so we set a 7:00 a.m. departure, fingers crossed. By 8:00 a.m. the following morning, Steve and I have already crossed Heart Bypass, skied an entertaining line of steep alleyways and glades on The Prow, and are now double-poling around Heart Basin, maintaining elevation for another 200-metre climb to Sun Dog Pass. Snow falls as we move silently through an elegant forest of subalpine fir. Ski penetration is 25 cm but the temperature is -10, keeping the snow light and dry. Still, it takes me a while to shake the cobwebs and match Steve’s pace. As we swap trail-breaking, the wind gusts and cloud cover obscure Sun Dog Pass. I puff up the final steep section then seek shelter in the snow scoop of a twisted krumholtz tree. We spot our next ascent, a committing, planar face leading to the knife-edged McBride/Rollins Col. But before all this, we feast on 250 metres of fall-line, untracked powder down dreamy glades into the drainage below. Two hours later, fatigue is setting in as we follow a ridge forested with white bark pine, grinding up to the finale, Gateway Col. At the pass we encounter a guided group from Hilda Hut, pausing for lunch. After a quick hello, we drop greedily into an untracked slide path before the group of seven gets to it. The snow feels ominously hollow and stiff near the top, so we skirt a convex roll and pick our way through dense trees before rejoining the avalanche path lower down. One at a time, we rip high-speed GS turns in the gut of this path, gorging on more untracked powder, not stopping until we reach the valley-bottom lake less than two minutes later—breathless. My legs feel heavy as we skin back up one last time, shuffling along a well-travelled track through a forest of massive spruce trees. Four hours after leaving Naumulten, we trudge to a stop outside the three-storey, post-and-beam Hilda Hut. “That might be a record,” says Martin Glasheen, looking at his watch, radio in one hand, extending the other to welcome us. But the silence of the mountain valley is suddenly shattered as the helicopter circles in. I can see the wide-eyed faces of our children through the cockpit’s bubble glass. Steve and I switch into parenting mode after Martin shows us our living quarters, strategically located in the lower level, and away from other guests. We have taken a luxury upgrade, going from a self-catered half week at Naumulten to a fully catered finisher at Hilda Hut—and the highly anticipated mountain cuisine of Shelly Glasheen. We start work immediately on a pump track for the kids, packing down a winding course that drops gently for 50 metres from the forest above to the hut, a feature that will buy us several afternoons of family entertainment. Body language speaks volumes. Immediately I identify the guests who avoid kids like influenza and the ones who seem to enjoy the injection of young energy, irrational temper meltdowns and all. Though everyone has been forewarned by Martin, I take the now customary step of making a blanket pre-emptive apology for whatever expectations of a peaceful mountain holiday are shattered by our presence. I have always envied pioneers like the Glasheens who create something rich out of nothing. Martin is a project guy. Wiry and strong, his boundless energy and enthusiasm belie his 60-something age. For decades he was a legendary treeplanter; “Glasheen the machine” they called him, a virtual one-man planting crew. He’s also lucky to be alive. In 1998, while working on a logging operation, he was crushed by a falling log, an experience that left him with chronic back pain. Ironically, he’s not much of a skier. Indeed, the sport is an afterthought for Martin; he’s much more interested in tinkering with the infrastructure that makes skiing in the Valkyrs possible for others. Like Valkyr Lodge, Hilda has flush toilets, WiFi, a sauna, a micro hydro power supply and Mt. Begbie Brewing draught beer. The next morning, we herd our kids through a forested sidehill down to a small lake below the hut. The little ones have become experts at the powder plow, a position that only young knees can withstand for any amount of time. Martin meets us at the lake with his dog and a harness with which to tow the kids around the frozen surface. Steve and I gaze at Mount Hilda, our next objective, which soars at the head of the valley. Zola giggles as she takes a spin around the frozen lake under canine power. I wonder what impression these winter experiences—helicopters, huts, powder, nachos in a snow cave—will have on such young little skiers who are so absorbed in the moment, not burdened with worries about avy conditions, who’s walking the dog back home, mortgage payments and so on. I can only hope they’ll have the same lasting impression as I did, so many years ago.